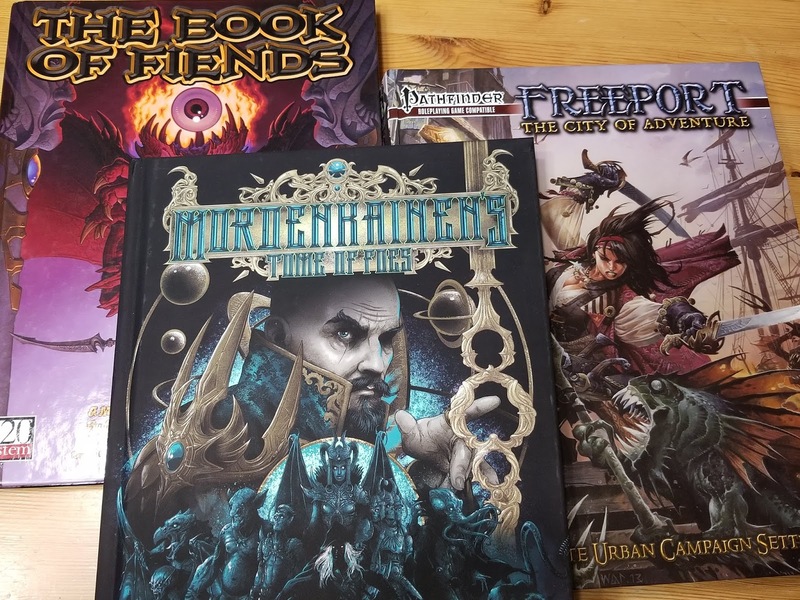 The newest D&D Fifth Edition hardcover, Mordenkainen's Book of Foes, provides details about some of the greatest conflicts throughout the D&D multiverse: the Blood War between devils and demons; the origin of the drow and duergar subraces; and the wars of the Gith. The second half of the book provides new monsters tied into that lore, including a large number of high-Challenge rating creatures (such as arch-fiends, supreme rulers among the drow, etc.). This new material is suitable for most D&D settings, but my interest for this series is in Freeport. This book's new material on devils and demons is imminently suited for use with the perennially cult-plagued city of Freeport. It can easily be combined with two 3E Green Ronin books, Hell in Freeport and The Book of Fiends, though the DM will need to makes some choices about which source to follow in certain areas. For example, yugoloths have never been Open Game Content, so Green Ronin had to develop their own versions of daemons to populate Gehenna in The Book of Fiends. The roster of archdevils has changed a few times over the various editions of D&D, including the falls of Moloch and Geryon from power--and the Book of Foes introduces a few new developments, such as the return to power of the corrupted celestial Zariel. A DM using The Book of Fiends can use the infernal hierarchy described there, or the one in the Book of Foes, or pick and choose from those sources as well as earlier editions' planar handbooks (notably the multiple versions of the Manual of the Planes and Book of Vile Darkness). Asmodeus is the one constant through all versions of D&D, so the lore about the King of Hell in Green Ronin's The Book of the Righteous may be useful here as well. The "Familiar Demon Princes" sidebar in The Book of Fiends (p. 140) describes many of the same demon lords that appear in the Book of Foes, but under thinly disguised names due to the strictures of the 3E Open Game License. Lolth (or "Arachnidia") is discussed in the next chapter, about the elves. References to most gods in Freeport titles are left purposefully generic, so that the city can more easily be combined with the DM's preferred campaign settings. DMs using The Book of the Righteous to fill in more detail may find the extensive racial pantheons presented here (and in the Storm Coast Adventurer's Guide) hard to reconcile with that book's Great Church model. However, the brief section on "Racial Gods" (BotR, p. 178) gives some ideas for how to approach this. Drow are a canonical part of the World of Freeport (at least since Cults of Freeport), though usually quite remote from that city. DMs who wish to draw upon as many Green Ronin sources as possible for their Freeport campaigns can compare Plot & Poison: A Guidebook to Drow and Dezzavold: Fortress of the Drow (both for 3E) to the information given about the Dark Seldarine in Mordenkainen's Book of Foes. Plot & Poison, for instance, presents its own drow pantheon ruled by an unnamed Spider Queen. Eladrin, sea elves, and shadar-kai were first presented for 5E in Unearthed Arcana (see Part 6 and Part 7 of my reviews of those columns). Mordenkainen's Book of Foes, however, gives far more lore about the extraplanar origins of both the eladrin and shadar-kai, and their relationships with their gods. This information makes it clear that while the eladrin are likely to visit the elven kingdom of Rolland from time to time, their loyalties lie within the Feywild. Likewise, while Lord Bonewrack could have ties to the shadar-kai, he rules only a minute portion of the Shadowfell. Freeport is a far cry from the security of a remote dwarven stronghold, but like many human cities of any significant size, it is home to a small population of dwarves. Most are merchants, adventurers, or outcasts--which probably makes them more like the others races in the City of Adventure than they would care to admit. Duergar also appeared as a potential player race in the Sword Coast Adventurer's Guide, which I've commented on here. When the gith races appeared in Unearthed Arcana, I pointed out that they had never appeared in any Freeport products because they were never made Open Game Content by Wizards of the Coast. However, at least one mind flayer (Cuttleblack) does appear in Freeport canon, so encountering a party of gith pursuing others of his ilk would not be out of the question. In addition, Mordenkainen's Book of Foes gives some details on githyanki airships, which could prove useful in some Freeport campaigns. And after all, githyanki raiding parties are essentially plane-hopping, psionic pirates. Halflings in Freeport have notably less innocence and leisure than the norm described here, but their ties to their community are just as important for their survival. Gnomes in Freeport are likely to be a mix of subraces. As I noted way back when I converted Rollo to 5E, the Player's Handbook says that most gnomes are rock gnomes, but the forest gnome has the minor illusion magic and ability to speak with animals that match his original 3E traits. On the other hand, rock gnomes in 5E are tinkerers and artificers, which also fits a number of gnomes in Freeport canon, such as the firearms inventor Kolter. Since the original Freeport Trilogy, other titles (the 3rd Era Freeport Companion and the Pathfinder edition of Freeport: The City of Adventure) have established the crag gnomes of Iovan as the dominant subrace in the World of Freeport. Crag gnomes have darkvision and an affinity for earth magic, which makes the deep gnome subrace a decent fit for them. See the previous sections for general commentary about demons, devils, drow, duergar, and eladrin. A few of the new monsters presented in this chapter, such as the allip and choker, are already Freeport canon, so their entries would prove very helpful in updating existing Freeport adventures to 5E. A few of the new fiends can be substituted for foes appearing in Hell in Freeport and The Book of Fiends. One of the better matches here is substituting orthons for the Faceless, as both are relentless trackers of similar power levels. Strange magical machines occasionally appear in published Freeport adventures, so new constructs such as clockworks and hellfire engines are appropriate additions to the setting's bestiary. Finally, star spawn are perfectly suited to the element of cosmic horror that has pervaded the Freeport setting since its debut. The larva mage in particular seems appropriate for a minor avatar of the King in Yellow. The Elder Evil blessings can be adapted to cults featured in Freeport sources (Radiant Flames for Tuulazcha, Tharizdun's Spark for the Unspeakable One, etc.) or used as inspiration for new gifts.